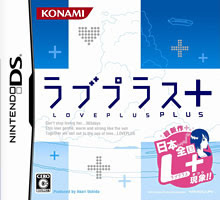 Note: Copy any of the above Love Plus + (Japan) rom download links and paste it into your browser to download. finally, it's here!! been looking for this!! thank you!! Is it true that you'll get dumped if you played the rom? Anyways thanks I'll try it later to find out. hallo! you think the patch for DSTT v2 will work on Acekard2i? Use Winrar to join the files. hey ppl,do u know why when i play tis game it doesnt work? thank u for changed the cover!